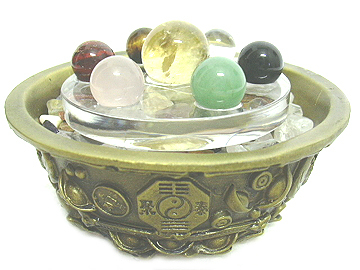 In Feng Shui, the wealth bowl is a wealth generator that almost all practitioners who intends to get rich would build. 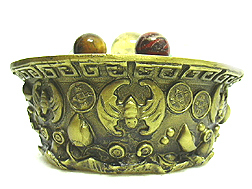 It is a bowl that is crafted with the favorite symbols of wealth which are the gold ingots, chinese coins and fortune bats. 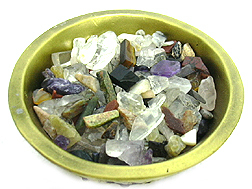 It is then being filled up with natural gemstones and sitting atop is the powerful Star of David. Using principles of sacred geometry, this exclusive 6-pointed Star of David greatly enhances and strengthen the inherent beneficial energies of crystal spheres. It will clarify your space and amplify good energy-charge to generate a fortunate, harmonious and healing environment that is suitable for creating wealth. The Star of David will continuously recycle "chi" in your surroundings endlessly. It will then start to build an aura in the space that will grow with time. Therefore if properly displayed in the correct corners, it can rightfully make one rich. This enhancer is best placed in the SE wealth corner, ones personal sheng chi location, any other wealth corner and the annual star #7 location. What Wealth Bowl symbolizes and how to display bowl? Wealth bowls filled with treasures is an extremely auspicious enhancer to accumulate abundance of wealth in your business premises and homes. In Asia, nearly all rich people who practise feng shui will have this powerful enhancer at wealth corners to attract in prosperity luck and lots of fortune. They are also often seen placed in front of Wealth Gods such as the Tua Peh Kong or the Chai ShenYeh. 5. The wealth bowl is a must for Tycoons and for those who are doing businesses. It sends vibes to our minds to remind us of money seeking opportunities. 6. Display the wealth bowl at your water and mountain star #8 locations or at your personal sheng chi location. Note: Do not display the wealth bowl on the floor, toilets and kitchen.